Have you ever felt stuck? Or as if you feel like you are giving it your all but not getting anywhere? I was struggling with cycling through attempts at losing weight and wasn’t making any progress. There may have been slight progress but it was never enough and I would, honestly, lose interest/focus or cave into my cravings. I was not in a good mental state. On the outside, in everyday life, I was my normal happy self; internally I was hard on myself, and sometimes down right mean. Something needed to change. When I heard about nutrition coaching with Kelly at Telos I thought about it for a while before committing, but after I started I never looked back! I was investing into my health, and there isn’t a better investment out there. Kelly made it easy, yes I said easy, in regards to nutrition and losing weight! She gave me the tools I needed to dive in and earn my results. As much as I wanted to lose weight, I also wanted to change my mindset around food. I no longer wanted to feel guilty after a treat or make myself feel bad about the choices I made. I wanted a healthy relationship with food. When I first met with Kelly she had me rank what was important to me. It really made me think about why I was doing nutrition coaching. Health was at the top of my list. We first focused on what I was putting into my body and I gathered a better understanding of what fell into certain categories and how it affected my body; how what I was eating helped my goals. I started to fuel my body and not just eat. We worked on portions and setting weekly goals to engrain the new habits. After a couple weeks I was seeing results, I was getting a return on my investment! When I say results I don’t mean on the scale, I never tracked my weight during this life changing adventure. Results I was seeing and feeling were in my mental state, how I felt around food, how my clothes fit and in the measurements. This lit a fire under me, I had to desire for more. I told Kelly this and we changed things up. We altered what I was eating and when. This part was a lot easier than I thought it would be. All I had to do was cycle my carb intake around my exercise. Since I had the full understanding of what I was putting into my body and the habits around portions, it was just a simple change. Who knew I could curb my love of bread?! Just over three months into nutrition coaching it was time for me to handle everything on my own. I had the tools needed and I knew what to do. I was nervous and excited to be on my own. I trusted the process and will continue to do so as I get even healthier. By investing into my health I have set myself up for the long term. I am mentally stronger, healthier, physically stronger, and of course lighter! Don’t sit around and wait for change, make change. If you have thought about nutrition coaching but were scared of judgment, if you have wanted to be healthier, stronger or have a better understanding of food, or even if you aren’t looking to lose weight but shape your body differently, Kelly is the coach for you. 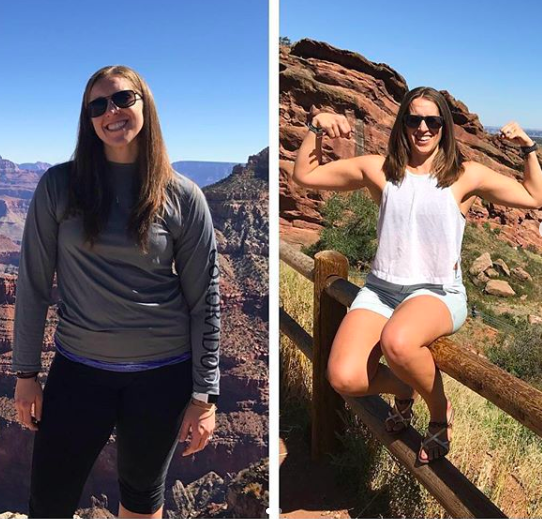 From Kelly: I am SO proud of Hannah- yes for her physical changes, but mostly for her mental and emotional changes in her relationship with food. Hannah trusted the process, crushed our weekly challenges, was honest, and 100% invested in following the plan. The results speak for themselves! She’s put the work in to establish healthy habits that will fuel her body for the rest of her life. Click on the link below to get started with Kelly today!